We went to visit Ryan today and went out to dinner at a place he likes called Mèzcal, where they serve cuisine from the region of Oaxaca, Mexico. Its namesake is a spirit also mainly produced in Oaxaca that is made from the agave plant, very similar to tequila (tequila is made with more exacting standards, but they’re both made from agave). 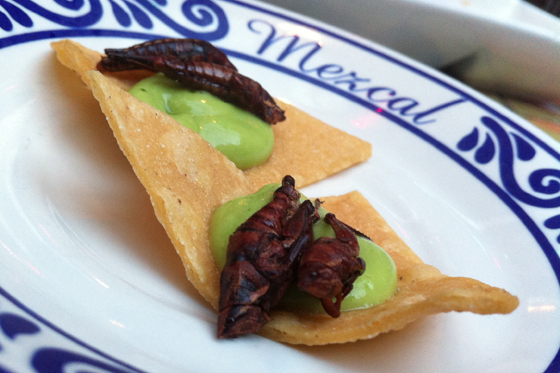 One of the popular things on Mèzcal’s menu is an item called “Chapulines”, which is “Sautéed grasshoppers, with garlic, lime & salt, served with a side of guacamole and tortilla chips”. Yum. 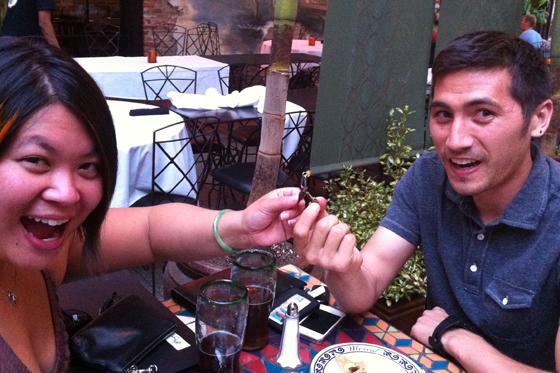 Ryan jokingly said he likes to take dates there to see if they’ll eat the grasshoppers, but he’s eaten them on several occasions and thinks they’re pretty good. Of course, I was going to have to try that. Normally in the dish, the grasshoppers are served with chips and guacamole, as they compliment the flavors of the grasshoppers, but I wanted to try one plain first, to really try to get the flavor of the grasshopper itself before mixing it with the guacamole and having the texture compete with the crunchiness of the chip. Cheers! The texture was pretty much what I expected – kind of like eating shrimp shells, but a little more delicate than that – there wasn’t any “meat” per se, but a lot of crispiness and a tiny bit of chewiness (these are pretty small grasshoppers). The flavor was salty, a little tangy from the lime, and the part I didn’t care for too much was that it was actually a bit fishy, kind of like the dried shrimp used in a lot of Asian cooking as flavoring, although definitely not as strong. It reminded me a bit of tamarind, also used in Asian (namely Thai) cooking; in doing research for this post, I found that tamarind is also used in Mexican cooking, so even though it wasn’t listed in the menu description, it probably was tamarind I tasted on this little hopper. On to the whole flavor experience, with the guacamole and on a chip. I liked how the creaminess of the guacamole cuts the tartness of the seasoning on the grasshopper, and the chip of course is a great vehicle for the whole thing. I kept tasting that tiny bit of fishiness, but I wonder if it’s a mental thing, since every time I taste tamarind it’s usually got fish sauce and/or dried shrimp flavors accompanying it. All in all, the grasshoppers were fine – I don’t know if I’d order them again, since I wasn’t crazy about that fishy note, but I’m glad I was able to try them. 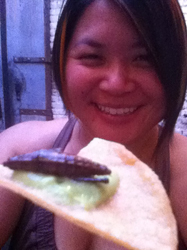 In doing more research for this writeup, I learned that many insects *do* in fact taste similar to shellfish! Strange, cool, and gross all at the same time. 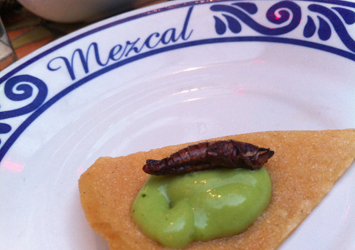 Kind of like eating your first grasshopper. Ha ha ha! LOL – in the last picture the chip looks as big as a dinner plate and Jiminy Cricket looks as big as a Polish sausage!